Suzuka Circuit, Japan - October 6, 2017. Toro Rosso's Carlos Sainz Jr. walks after crashing during practice. 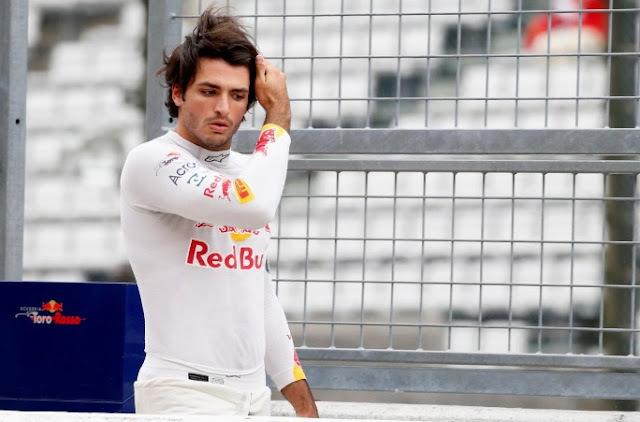 SUZUKA, Japan - Spanish driver Carlos Sainz will replace under-performing Briton Jolyon Palmer for the last four races of the Formula One season, Renault said on Saturday. Sainz was due to join from Toro Rosso at the end of the year but Renault said in a statement that the team and Palmer had now agreed to end their relationship by mutual agreement after Sunday’s Japanese Grand Prix. The remaining races are the U.S. Grand Prix in Austin, Mexico, Brazil and Abu Dhabi. “The Japanese Grand Prix will be my last race for Renault. It’s been an extremely challenging season and I’ve been through a lot in the last three years, but it’s been a tremendous journey overall with the team,” Palmer said. The 26-year-old’s options would appear to lie outside Formula One since those teams with potential vacancies have expressed little interest. Palmer scored just one point last season and has drawn a blank in all but one of his races this year, finishing sixth in Singapore. There were only 12 finishers in that race, with both Ferraris and Red Bull’s Max Verstappen colliding at the start. Sainz is officially joining Renault on loan from Red Bull as part of a deal that allows Toro Rosso to terminate their engine contract with the French manufacturer and start a new partnership with Honda. His early departure will see the return to Toro Rosso in Austin of Russian driver Daniil Kvyat, who was recently dropped to make way for French rookie Pierre Gasly. The Italy-based team, who have yet to finalise their 2018 lineup, confirmed that move in a separate statement. Sainz, who has scored most of the Red Bull-owned team’s points this year, thanked Toro Rosso for releasing him early and promised to do his best on Sunday. “This would be the best possible send off,” added the Spaniard, who is set to start on the back row due to a 20 place grid penalty for changes to his car’s power unit. Spanish driver Carlos Sainz will replace under-performing Briton Jolyon Palmer for the last four races of the Formula One season, Renault said on Saturday.